Lock in a great price for Villa Cortine Palace Hotel – rated 9.3 by recent guests! Absolutely gorgeous location with spectacular parks and cozy sitting areas. Private beach access and the head of service is a top notch gentleman with impeccable manors and politeness. Most of the servers were well trained and did a wonderful job...with one major exception! The grounds were spectacular, the pier for lakeside swimming/sunning was beautiful. The breakfast offered a large variety of options. The bed was comfortable, and the TV received the World Cup games. Everything was splendid! The staff was especially helpful and courteous.! Beautiful grounds, Fantastic rooms, spectacular views! The property is magnificent, the position, the building and the way it is all maintained. It deserves it *****star status. The hotel's beach access was amazing and the grounds of the hotel were beautiful. The staff was so friendly and helpful. There was wifi everywhere at the hotel that made life convenient. We will definitely be back to stay here again some day. The place is magical. The beautiful garden and the lake in the backyard. Beautiful scenery. Excellent location. Comfort. Friendly staff. It was just PERFECT! Extremely beautiful hotel in a very picturesque setting. Staff could not have been more helpful and friendly. Breakfast selection was varied and delicious. Sirmione is a very pretty town with a number of excellent restaurants and trattorias. Access to the rest of the lake via the ferries is really easy from Sirmione - even in October when we visited. Weather was also sunny and warm and there were still plenty of people around, although it wasn’t crowded. Villa Cortine Palace Hotel This rating is a reflection of how the property compares to the industry standard when it comes to price, facilities and services available. It's based on a self-evaluation by the property. Use this rating to help choose your stay! 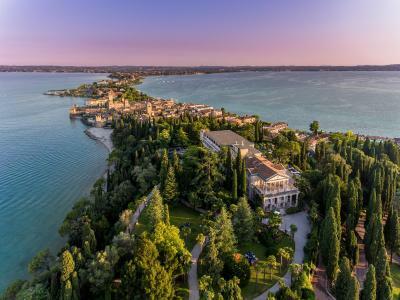 One of our top picks in Sirmione.Located in a secluded area 5 minutes' walk from Sirmione's historic center, Villa Cortine has beautiful gardens where you will find a pool, a tennis court and a private pier. Guests enjoy free use of parasols and sun loungers at the beach. Close to Catullus's Villa at the tip of the Sirmione peninsula, at Villa Cortine Palace you will be able to enjoy the same views across Lake Garda as Roman nobles once did. Villa Cortine's 4 hectares of gardens have fountains and statues. In summer, you can sunbathe on the hotel's pier or swim in the lake. You can also order drinks and meals directly by the pool and in summer barbecues are organized on the beach. Interiors at Villa Cortine Palace Hotel are charming, with marble décor and frescoed walls. Rooms come with LCD satellite TV, air conditioning and mini-bars. When would you like to stay at Villa Cortine Palace Hotel? Elegant room with air conditioning, a TV and a fully equipped private bathroom. Some rooms have lovely views of the gardens. Spacious, elegant room overlooking the gardens. Includes a TV with satellite channels, air conditioning, and a fully equipped private bathroom. Some rooms have a balcony. 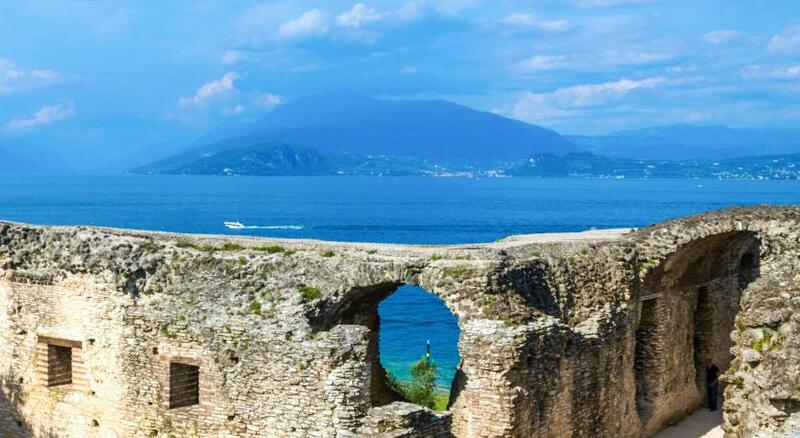 Featuring a large terrace overlooking Lake Garda and the historic center of Sirmione. This elegant room includes air conditioning, a TV and a fully equipped private bathroom. Featuring a balcony with views of the grounds and partial views of Lake Garda. This spacious junior suite includes a comfortable sitting area, a TV and a fully equipped private bathroom. This very spacious, open-plan suite features an elegant lounge area with a TV, a large bedroom, and a fully equipped private bathroom. House Rules Villa Cortine Palace Hotel takes special requests – add in the next step! Villa Cortine Palace Hotel accepts these cards and reserves the right to temporarily hold an amount prior to arrival. Please note, the property's pier is available from mid May until mid September. Please inform Villa Cortine Palace Hotel of your expected arrival time in advance. You can use the Special Requests box when booking, or contact the property directly using the contact details in your confirmation. End of season so some staff had already clocked off! We weren’t shown around the hotel to see everything offered only the entrance hall. Everything except the price of food and drinks. Food and drinks do not correspond to the price. you could have the same quality, tasty food in old town of Sirmione. I can understand if the price is 20-25% higher, not 100-150%. We saw a lot of your guests at restaurants in Sirmione. I wanted to find somewhere special to celebrate my Mother’s 70th birthday so we stayed at this wonderful hotel. 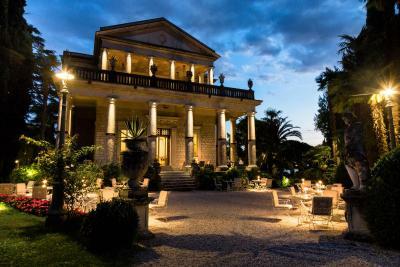 Set in 4 hectares of private parkland in the prime spot in lake Garda, we really did feel like exclusive palace guests. The hotel and grounds were immaculate. The staff were wonderfully friendly and seemed to anticipate your every need with understated elegance. The concierge team were very warm and kind and organised a series of special treats for us, including a boat trip in a Riva, which was glorious. Loved every minute. Staff generally helpful, but we found ourselves always with spoons, forks, knives, generally missing from the breakfast table, i.e. not a complete place setting. Staff not always easily located at breakfast. An oasis of calm and serenity while the hustle and bustle of Sermione goes on around the grounds. Wonderful staff, their sole aim is to ensure your stay is memorable, lovely having breakfast in the open air. The main reception rooms need a sensitive and loving hand to maintain the ambience but improve the furnishings. The bar needs a serious interior upgrade in keeping with the original house. Total luxury. Superb gardens ,beautifully maintained. Excellent staff. Delightful bedroom old fashioned in the nicest possible way. Swimming area absolutely stunning with excellent restaurant attached. General feeling of going back in time to an age of luxury and slower pace. We loved our stay here, it is expensive but definitely worth every penny. Very few hotels like this left. Excellent customer service, great location, private beach area, historical building with big garden. If I’m being really picky - The restaurant down at the lake was a little formal and expensive for our liking - it has an amazing bbq / grill chef which is great if you want that, but there are no options to get just a nice sandwich or salad / snack at lunch. Sometimes you just want something light and don’t want to sit at a formal restaurant in the middle of a days sunbathing?. It would be good to offer a slightly more relaxed menu too. Literally can’t think of anything bad about the place - all highly positive! Stayed here as a real treat for 2 nights with my husband. It’s expensive but worth it - the staff can’t do enough to help you and make your stay perfect. Waiting / restaurant staff and reception - all fantastic and super friendly. Our delux room was beautiful with an extra large balcony - fab view, and comfortable bed, high quality linen. Large bathroom with ample good quality shampoo / bath foam etc. Complimentary bottle of prossecco on arrival which was a nice touch. We loved sun bathing on the private pier - beautiful part of the lake, with a hotel lifeguard who was stationed at the gate to stop non hotel guests from entering - was nice to know your posessions are safe when swimming in the lake. The grounds of the hotel are manicured and beautifully kept - pool area clean and very comfortable sun beds with as many towels as you need. The main Al fresco Restaurant was a delight to eat at - make sure men wear long trousers as my husband only had tailored shorts with him. They made an exception for us but worth knowing. Cleanliness is impeccable - rooms cleaned daily and to a high standard. Overall a stunningly beautiful hotel in a fab location (2 minute walk through a private gate into the heart of town). 5star luxury and well worth a visit!